The Pleasant Hearth stove is one of the best wood stoves currently on the market. It has an attractive design, large heating area, and affordable price. We like to think of this product as the “everyman’s stove.” If you are new to burning wood for home heating then this is the stove we recommend. Let’s take a closer look. ✔Efficient Heating: Stoves can look modern or artsy, but if they aren’t doing their job to heat the home then they’re worthless. The Pleasant Hearth takes this commitment seriously, and expands on that with a great EPA efficiency rating and only 3.6g/h of emissions. This means that you’ll be getting the most heat from your wood fuel. The addition of a blower helps quickly warm rooms, and the long burn times ensure that there’s minimal loading work involved. ✔Design: The stove has a classic cast iron door, chrome handle, and ceramic glass viewing window which add a rustic vibe to any space. This stove is about function as well. The interior firebox is lined with brick and features an ash catcher (similar to the grease pan on a grill) so the ash can be easily swept away. Finally, there is a draft control user on the front of the unit, so the user can control how much air enters the stove. These features allow the stove to heat up quickly, and allow the user to tweak the settings for maximum heat output. ✔MADE IN THE USA: It is always great support American manufacturing, especially with a product that was used by colonists to heat their homes. ✔5 Year Warranty: Always nice when a company provides a service like a warranty to make your buying decision a lot less stressful. ✖Curing Time: The stove requires “curing,” which is the “off gassing” (during a fire) of paints and oils used in the manufacturing process. This is perfectly natural, but can produce some smelly results. We recommend lighting the first few fires outside or heavily ventilating your home. This way you won’t be subject to the fumes. After around 3 fires the stove will be fully cured, and will no longer produce any unnatural fumes/odors. ✖OK Heat fan/blower: A blower is an internal fan that helps circulate hot air throughout the room by drawing cool air in. This comes with the stove itself, and does a decent job of moving air, but the variable speed settings do not make much of a difference. ✖Misc: A few cases of mishandling led to some products being damaged, but his was rare. Some reviewers also wished that the stove could accommodate larger logs. If you choose to purchase this stove make sure you buy the right size. 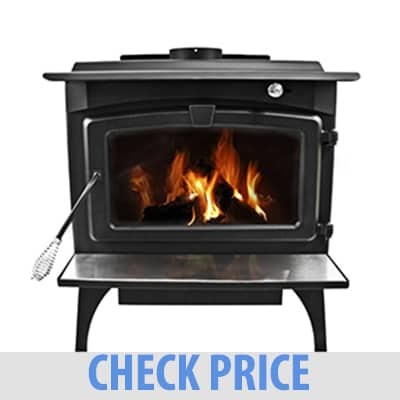 The 2,200 heating radius stove is classified as “Large” size, and should heat a small house. There are also relatively similar “Medium” and “Small” sizes. The medium should work well for a small cabin, and the small for a large room. These are only estimates, and it is hard to be accurate when room sizes vary and stove output is not always exactly what it claims to be. Reviewers loved how the stove would keep them toasty warm throughout the long winter, and were pleasantly surprised at the heat that was milked out of each log. In the end, what really made them choose this stove was it’s price point and enduring reputation. Overall, these purchasing justifications seem to hold true. This is a decidedly “low-frills” stove, but it does the important things properly. In regards to the Pleasant Hearth though, we will agree with the reviewers, and say that the history of reliability, affordability, and style make it the http://bestsmallwoodstove.com top choice for first time stove buyers in 2017.